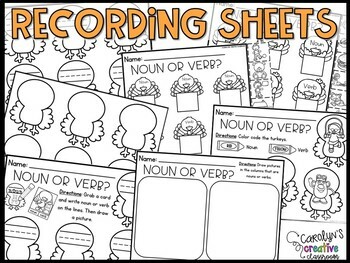 Are you looking for a small group activity to review nouns and verbs ? 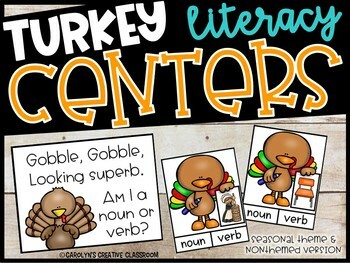 Need a hands-on literacy center that is self correcting and review nouns and verbs? 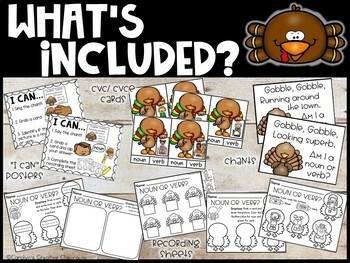 Planning Thanksgiving/ November Centers? Look no further! Small Group Instruction - This is perfect to pull a small group for intervention time! Whole Group - Chant the poem and have students pick out a a card. Then have the students decided whether it is a noun or verb based on the picture. This would be perfect for a quick review during morning meeting or end of the day! Print the cards and poem on cardstock for extra durability. I would recommend laminating the cards so you can use them again and again. It works well to keep them in a baggies or crayon boxes. What if I need something added? 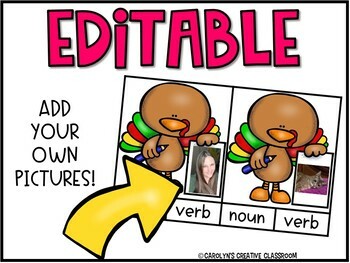 If you would like any custom pages, please e-mail me at carolynscreativeclassroom@gmail.com and I would be more than happy to create it for you! How do I open this? Please note: You will need Adobe Viewer to open these cards. They are secured and flattened. You need PowerPoint to utilize the editable document. Like this? Check these out! Hope you find this resource useful! =) Don't forget to write feedback. You get FREE money to spend on Teacher's Pay Teachers! !